Is there a place for humans after the robot revolution? 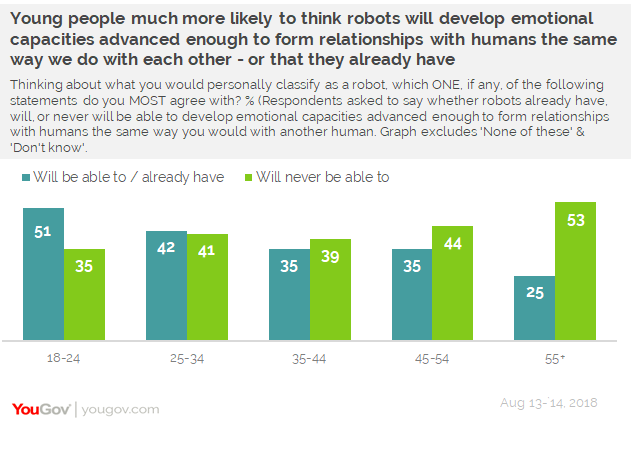 November 01, 2018, 9:50 a.m.
A majority of Brits believe robots will surpass human intelligence, and a third say they will even be able to form emotional relationships. So what role remains for humans? We see machines tirelessly doing jobs previously undertaken by humans every day, from the self-checkout counters at the supermarket to robotic vacuum cleaners bumping from skirting board to table leg. 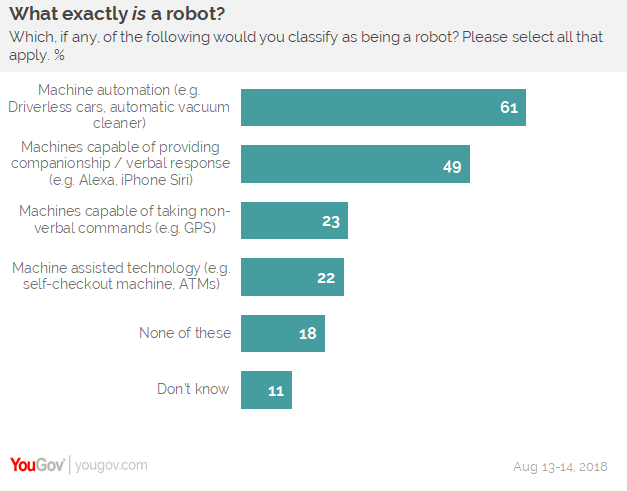 So it’s no surprise that a quarter of Brits worry that their own jobs will be seized by robots within a decade, as revealed by a YouGov survey for Trade Union Community and the Fabian Society. 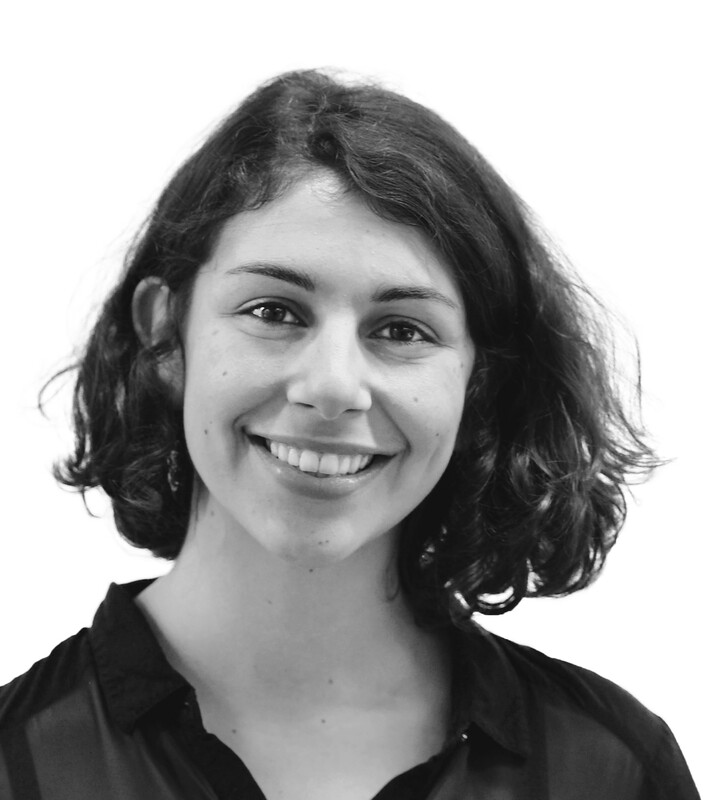 As we face obsolescence caused by the machines that we ourselves designed, it’s time for some soul-searching; what can humans still bring to the table? Will there always be a place for human intelligence? How smart are robots, compared to humans? When it comes to intelligence, the majority of Brits are convinced that robots have either already surpassed humans, or will in the near future. One in five (21%) say they have already overtaken us, while four in ten (38%) predict that they will do so in time. Only a fifth (20%) doubt that they will ever be able to reach those levels. Young people are significantly more likely to think robots either already have developed (26%) or will be able to develop (48%) higher intelligence than humans, compared to one in five (18%) of those aged 55 and above believing they have, and a third (35%) believing they will. In the same vein, older generations are more than twice as likely to think robots will never develop human levels of intelligence. One in four (26%) of over 55s feel that way, compared to just one in eight (12%) of those aged from 18 to 24. Can robots really be our friends? Worry though we might about robots taking jobs from humans, it’s often said that at least the capacity for emotion, sensitivity and creativity is ours alone. However, researchers are already creating robots capable of displaying compassion – a development which could have a revolutionary effect on society, with empathetic robot nurses capable of caring for our elderly. Just one in twenty (6%) Brits think robots have already developed emotional capacities advanced enough to form relationships with humans, but over a quarter (28%) think they will do so in the future. Young people are significantly more likely to see this as a possibility, with nearly half (45%) of 18 to 24 year olds saying so compared to just one in five (19%) of those aged 55 and above. Just a third (35%) of those aged 18 to 24 think robots will never be able to develop advanced enough emotional capacities to rival human relationships, rising to just under half (45%) of the population as a whole. YouGov research reveals Brits are divided on exactly what they think counts as a robot. Respondents were given a list of different technologies and asked which they classified as a robot. The form of technology most likely to count is ‘machine automation’ – inventions such as driverless cars or automated vacuum cleaners, which six in ten Brits (61%) are robots. Half (49%) of Brits see machines capable of providing companionship, such as Alexa or Siri, as robots. One in five Brits (22%) would classify ‘machine-assisted technology’ – such as a self-checkout machine, or an ATM, for example – as a robot. The same proportion (23%) see machines capable of following non-verbal commands, like a GPS device, as robots. 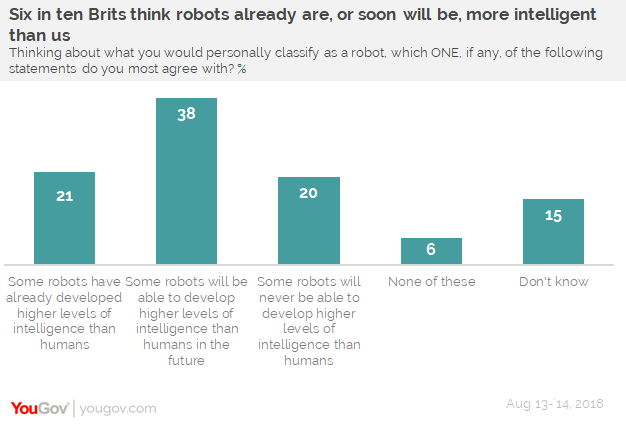 Just under a fifth (18%) see none of the above as robots.